Bear Lake is a popular destination for visitors from Utah and Idaho, known for its brilliant turquoise waters and spectacular scenery. The area around Bear Lake is a recreation playground, with dozens of fun activities both in and out of the water. Boating and water sports are the most popular activities on Bear Lake's deep, clear, turquoise blue waters. You can bring your own boat or jet ski, or rent one at the lake. BearLakeFun offers rentals of a considerable assortment of vessels, including ski boats, pontoon boats, and fishing boats. If you're in the mood for adventure, their 24-foot wakeboard boat holds 17 passengers, among the largest available for rental from any company. Bear Lake's most famous beaches are Rendezvous Beach and Ideal Beach in Utah, as well as North Beach and East Beach in Idaho. Water levels and water temperatures vary at these beaches, so it's good to check ahead of time to make sure conditions are right for a fun day at the beach. The crystalline brilliant blue waters will have you convinced you're at the Caribbean! The Bear Lake area's signature dessert is the Bear Lake raspberry shake. You can get a thick shake made with local raspberries (in season) and local ice cream almost anywhere in the area that sells food, but some of the favorite places to get them are LeBeau's, Quick-N-Tasty, and Hometown Drive Inn, all in Garden City. If you feel like getting out of the water and exploring the gorgeous natural scenery around Bear Lake, you can take one of the area's landscape-rich drives, including the Oregon Trail-Bear Lake Scenic Byway, the Logan Canyon National Scenic Byway, the Bear River Heritage Area or Bloomington Lake. One these drives, you'll have panoramic views of the lake and the surrounding Bear River Valley. Minnetonka Cave, about 15 miles away from Garden City up St. Charles Canyon, makes a great change of pace or rainy day activity during your trip to Bear Lake. This nine-room cave is filled with fanciful rock formations that you can explore on a half-mile guided hike. Bring a jacket, as the cave is a cool 40 degrees year round. Bryce, the knowledgeable and entertaining owner of Cisco's boat rental and docking facility, knows as much as anyone about Bear Lake's history, geology, wildlife and folklore. Bryce will take your party of up to six people on a personalized tour of the lake, on a 24-foot pontoon boat. The Bear Lake town of Garden City holds its Raspberry Days festival the first weekend of August, to celebrate the peak of the raspberry harvest. Raspberry Days events include a Little Miss Berry pageant, craft fair, parade, rodeo, a 5K fun run, pancake breakfast, dances, and fireworks on the beach. The Pickleville Playhouse in Garden City, in business since 1977, performs hilarious melodramas and lighthearted Broadway favorites. It's a fun date night or family outing after a day on the lake. The onsite restaurant, Bandito's Western Grill, serves Western favorites like steak and grilled chicken. For trail riding around beautiful Bear Lake, you can bring your own horses to explore trails in the Cache and Caribou National Forests, or hook up with an outfitter like Beaver Creek Lodge, which offers rides ranging from one to three hours. Beaver Creek can also plan longer day trips. Birds and wildlife are abundant in the Bear Lake area, but one of the best areas for birdwatching is the Bear Lake National Wildlife Refuge, about 10 miles from Montpelier, Idaho. The refuge is home to sandhill cranes, herons, snowy egret, white pelicans and a variety of ducks and geese. Walking trails take you to view the birds and other wildlife found at the refuge. Hiking and mountain biking are popular activities around Bear Lake, which is surrounded by national forests. The Limber Pine loop, at just a mile-and-a-half long, is a favorite for anyone interested in a relaxing jaunt with gorgeous views and wildlife. The trailhead is seven miles west of Bear Lake on Highway 89, the road that takes you into Logan Canyon. More ambitious hikers can tackle the nine-mile Sink Hollow Trail, near the Beaver Mountain Ski Area on Beaver Creek Road, about 20 minutes up Logan Canyon from Bear Lake. This trail crosses through sagebrush meadows and aspen groves, before reaching a small lake. It's even possible to road bike all the way around the lake, a distance of about 50 miles. Bicycle rentals are available at the Bear Lake KOA. Beaver Mountain, about 15 miles from Bear Lake, offers affordable snow skiing with six lifts. Adult day passes are only $48, as of 2018. In winter, the Bear Lake area becomes a snowmobiler's paradise, with hundreds of miles of trails. The season begins in late November and runs through April, so with more than 300 miles of groomed trails, it will seem like you're able to drive forever through a winter wonderland. You might even be able to spot a moose! 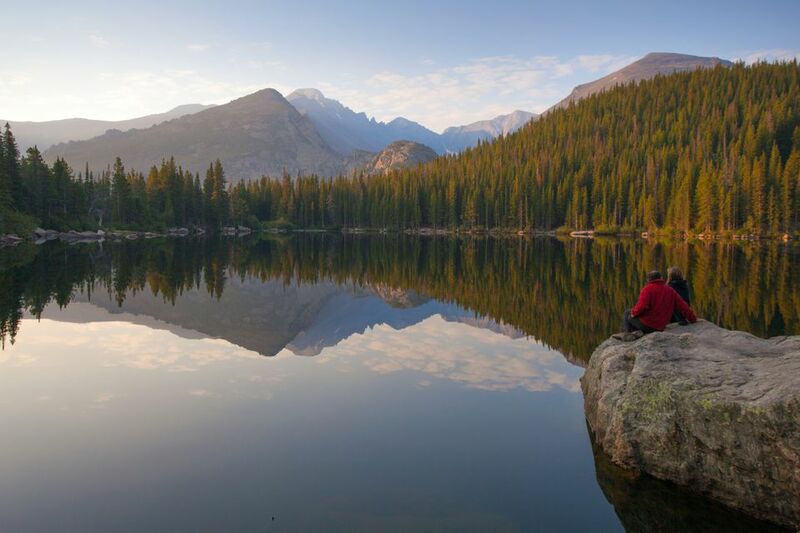 Bear Lake is known for trophy-size native Cutthroat trout and lake trout. In winter, the Bonneville Cisco, which live only in Bear Lake, can be caught with nets through holes in the ice. Local guides like Travis Hobbs can take visitors out for trout or bow carp fishing excursions throughout the year.